That Grand Prize for 2007 goes to Joshua Delger, a graduate research assistant in the Department of Wildlife and Fisheries Sciences at South Dakota State University in Brookings, S.D. Delger's photo was well composed and caught all of the judge's attention with its mix of colors and the posing of bird and hunter. Delger tagged his 23-pound trophy in Minnesota this spring. 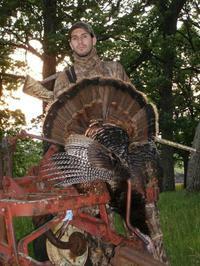 Delger will receive a Mossy Oak turkey vest stuffed with calls. This year's second place finish goes to Gabe VanWormer of Bancroft, Mich., for his photo of a very happy and successful Haley Jennings posing with her first turkey on her 10th birthday. 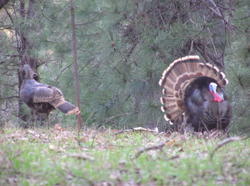 Gabe will receive a Pretty Boy turkey decoy along with a few calls. And finally, third place goes to Bob Krummel for his photo of his son, Jake, 13, posing in the snow following a successful cold-weather spring hunt that result in Jake's taking of a 22-pound jake! Huge jake. Bob will receive some mouth calls to share with his son Jake. I'll be contacting all of the winners early next week to confirm addresses. Thanks again to everyone who participated and check back often for future contests on The Strut Zone. The Strut Zone will soon be getting back down to off-season news, gear reviews and whatever else comes along as our 2nd Annual Give Us The Bird Photo Contest finally comes to a close. Oh yeah, I still have one hell of a weird trip to Mexico I need to tell you about. This last photo of the contest was sent in by Eric Ray who took this trophy atop a mountain near Kooskia, Idaho. Eric says he called the bird, and his buddy, both which came in strutting, across a canyon, fence, road, river and up the hill! It took him nearly 2 hours. Stay posted as we'll announce this year's winners later today!!!! 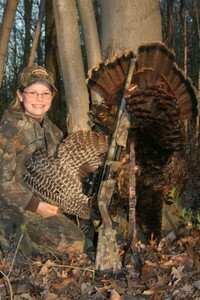 Levi Banks, who only small game hunted as a young boy, is a recent convert to turkey hunting. As you can see, he's become a fast learner. 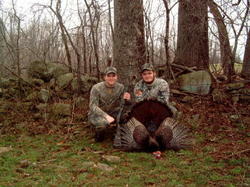 These are my first two turkeys taken during my first two hunting seasons, the spring and fall of 2006. I got a lot of help and guidance from some friends, on-line articles and a hunting/fishing related magazine or two. A friend donated the camo, my dad let me borrow a gun, I made the turkey call, and I went on public land by myself. Partially I got lucky, but I also worked pretty hard to get these. I had to walk at least a mile for the spring bird (my first day out!) and two miles for the fall bird, one way. Both were taken on the same conservation area near the Missouri River. 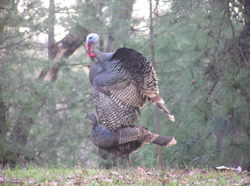 The spring bird weighed about 20 pounds, while the one in the fall was about 23. The spring bird had a 10-inch beard and 1 1/4-inch spurs; the fall one had a 12-inch beard and 1-inch spurs (Editor's Note: What a hog!!!!! Look at that rope!). I got one about the same size as last spring this spring, but my digital camera was broken at the time. You can ask my wife though, as soon as I pulled the trigger on my first turkey I knew I was hooked. I hunted almost everyday I could for the fall season, stumbling upon the bird I got one day and realizing he wouldn't come to a call went back a few days later to sit under his roosting tree and wait for him. 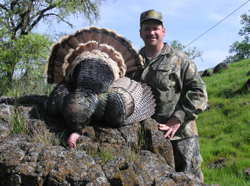 I could go on all day...it may not be worthy of Hanback's blog, but I also got my first deer last year and have been making plans to fill the freezer with turkey and deer this fall. Thanks for the story and pictures Levi. Dude, you are definitely hooked. Welcome to the Obsession! 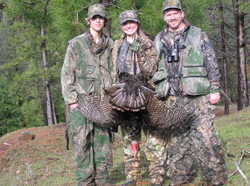 No, that headline is not a typo, as this Idaho trophy was taken on the third day of the spring turkey season by huntress Sandy Gage of Cathlamet, Wash. She took the trophy, her first ever, at 7:45 a.m. The beard measured 9 inches. Congrats on your first bird Sandy. 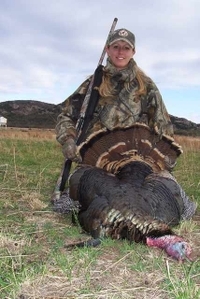 We are in fact seeing a lot of first birds, particularly by women hunters who have gotten tired of watching their husbands get up and go out to have all the fun. The Strut Zone applauds all of you first timers out there and hope that the success you've shared with us this season keeps you fired up for next. Sandy will be entered into the Give Us The Bird Photo Contest. Winners are to be announced tomorrow! Josh Noll (left) of Vassalboro, Maine, sent us this one earlier in the season to show off the bird he helped call in for his younger cousin Tim during the state's Youth Turkey Hunt. It was Tim's last year he was eligible to hunt the youth day due to his age. 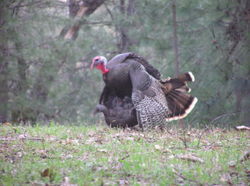 The two started the day on a hill near Josh's home where birds could typically be found. This morning was no different as a single tom was up there. Unfortunately, it had a bunch of hens around him, and despite the hunters pulling the turkey to within 40 yards, Tim couldn't get a clean shot off. The birds soon moved off. The two heard another bird off in the distance that was "gobbling his head off" so they set off for him. Setting up once again, it didn't take five minutes to pull this second tom in. "Tim hesitated making the shot because this was the biggest thing he has had in his sights, but he ended up making a great shot," says Josh. The tale of the tape: 18 pounds, 7-inch beard, 1/2 inch beard. tagging station with a bird for this season." Nothing wrong with that, Josh. Nothing wrong with that at all. Thanks for sending the pic in and sorry it took so long to get posted. You're entered in the photo contest. Stay tuned. Winners will be announced this Friday. Joshua Delger, a graduate research assistant in the Department of Wildlife and Fisheries Sciences at South Dakota State University in Brookings, S.D., one of the top universities if you like to hunt and fish as reported on recently in Outdoor Life, does his best to take this photo contest to new artistic levels. Great shot, Joshua. Here he poses with a huge Minnesota trophy that he took while hunting in the southcentral region of the state. It tugged the scales at a hefty 23 pounds and the beard stretched 10 3/4 inches. It's snowing in New York City as I write this and read over some emails from hunters who have already tagged their first bird in sunny Florida. I have to shake my head as I watch the countless flakes dip and dive in the canyons formed by the office buildings. I suppose we each spend our own special way, killing time and filling the hours until turkey season arrives. For those folks in Florida and—in a matter of days—other southern states, the wait is over. For others farther north, like OL contributor, Steve Hickoff in Maine, hunting season is still a ways off. Hickoff sent me this picture the other day of how him and his daughter shared some time together on a recent snowy day. "Poor guy," I thought as I read over his email. "He is a man afflicted. 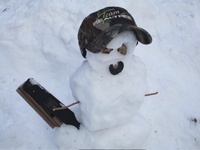 Can't even make a snowman without obsessing over turkey season." In the flowerbed beside the walkway that leads to my front door, there are lined three solar-powered lights. Even in summer, when the days are long and sunlight shines for the better part of a day, the lights only offer a soft glow in the dark, primarily because my house faces north and the small solar panels atop each beacon spend most of their time in perpetual shade. Christy Fite, the pretty young mother of two, who is both an avid hunter and hard-charging NWTF volunteer, is a featured hunter on the Turkey Federation's Turkey Country television program this week. You might remember Fite from The Strut Zone where she won second place in the Give Us The Bird Photo Contest earlier this summer. 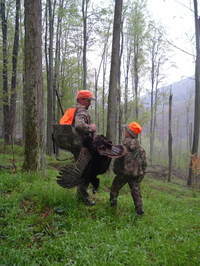 Turkey Country airs on the Outdoor Channel every Saturday, Monday and Wednesday. If you missed Fite along with fellow Oklahoma volunteer Mike White and NWTF Regional Director Gary Purdy on their hunt for Sooner State Rios, you have one more chance on Wednesday, Aug. 16 at 7 p.m. Check it out. I know it's late in the evening, but as promised, here are the winners of the inaugural Strut Zone "Give Us The Bird" photo contest. We had dozens of entries and some tough competition between many of the pics when it came to judging the winners. 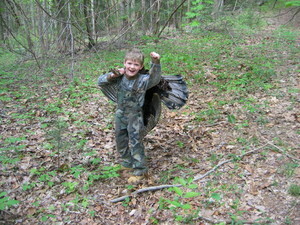 Young James Smith of North Carolina (first picture), whose dad, James, submitted the fantastic image of the boy celebrating his first turkey. The look on James face says it all. Great photo Dad and congrats to James. In addition to a call package made up of calls by Hunter's Specialties, Knight & Hale, Quaker Boy, Primos, Woodhaven Custom Calls and Woods Wise, you will also receive a Pretty Boy Decoy from Carry-Lite as well. Oklahoma turkey hunter, dedicated wife and mom and NWTF chapter president Christy Fite earned a well-deserved second place finish in the contest for this pic of her Rio that she took early in the season. Fite killed the Rio during a hunt being filmed by a crew from the NWTF shooting the adventure for one of their programs on the Outdoor Channel. Fite not only chases gobblers in the spring, but is also an avid deer hunter, who has helped introduce to the sport to a number of women and children through events conducted by her chapter. Christy will receive a complete call package to practice with and use next spring. Matthew Sell, a student at Frostburg State University in Maryland, took this photo of father/son hunt team Eric and Trey Claar during a hunt in nearby Pennsylvania. The image captures everything that's great about sharing the woods with a your kids and bringing them up with an appreciation for the outdoors. It is an image of represented in hunts shared by fathers and sons, but as our next winner shows, isn't exclusive to boys. Of course, I'm getting ahead of myself here. Congrats, Matthew. Your prize pack is on its way. There's just something about a young hunter that appeals to everyone and this photo of 14-year-old Nicole Larsen sent in by her father Ron is no exception. While photos shot in driveways or in the back of a truck don't usually come off as the most aesthetically pleasing, Nicole's proud look and that awesomely thick rope strategically placed hanging over the bed caught everyone's eye who voted. Nice shot, Dad! 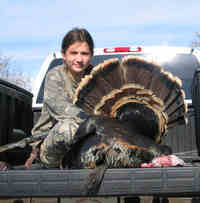 What's maybe even cooler is that the young hunter passed up on six jakes before tagging this California longbeard. Hope you enjoy the calls Nicole. You might want to kick one or two to your Pop for putting your name in the hat. 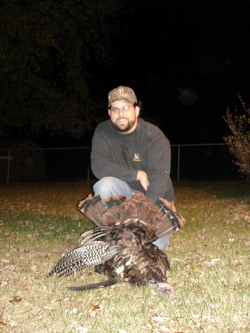 Matthew Jones of Kentucky has been one of the Strut Zone's earliest followers, even offering detailed scouting reports for his fellow Blue Grass State hunters prior to this past spring season. From all accounts of those who know young Jones, he's one heck of a hunter. His past season was well-documented with photos as he helped call birds in for a variety of friends and relatives. 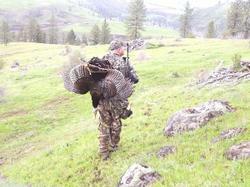 One of those shots (pictured here) earned the hunter fifth place in our Give Us The Bird contest. The judges really felt it captured the glory of what being in the spring woods is all about. Congrats, Matthew. Now if I can just find your e-mail address! Just joking. Stuff's on the way. In fact, everybody's prizes will be shipped out as soon as I can confirm your addresses. Our intern has been looking for more to do. Guess it's time for her to become acquainted with the mail room! Joe Slaton, a.k.a. 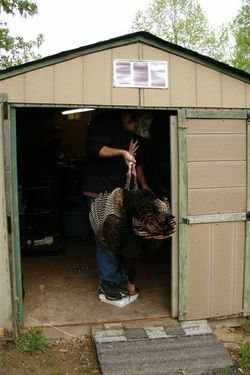 TRKYHTR on the message boards, sent us these cool pics, but no story, of a live tom attempting to mount what looks like a taxidermied hen decoy. There are also a couple of shots of hunters, I'm assuming one is of Joe. Since all we have are the photos, well, enjoy. And Joe, if you're out there, fill us in what's going on! Regardless, Joe will be entered into our "Give Us The Bird" contest with prizes offered by Carry-Lite, Hunter's Specialties, Knight & Hale, Quaker Boy, Primos, Woodhaven Custom Calls and Woods Wise. The deadline for entries has passed and winners will be announced tonight, Monday, July 17. And with these pictures, we have now posted the last of our Give Us The Bird contest entries. It's been a great first attempt at a photo contest and I hope it's been as much fun for you as it has been for me. I especially want to thank all of our sponsors mentioned above. Stay posted for the announcement of our winners later this evening.